Flat rates of 2.50%-2.90% are all the rave these days. 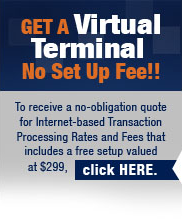 No hassles to set up, no fees to deal with, it’s a no brainer, right? Especially since merchant service providers have a list of fees longer than the menu at Starbucks. Nobody wants to pay all those fees, and since the Durbin Amendment, they just keep added more and more. Well, truth is, even though you’re set up with just a flat rate, you’re already paying them. How do you think PayPal, Google, Square, and all the other came up with their rates? They have to cover those fees too, so they used the law of averages as to what cards you’ll take, to set their rates. Let’s say you’re a retailer, with a small to mid-sized average sale. Chances are the majority of the cards you take are debit cards. Also, most likely the majority of the cards you take are “regulated debit” cards, due the the Durbin Amendment I mentioned above. If you’re in a large metro area, like Houston, almost all are regulated. What does that mean? It means the wholesale rate of those cards are .05% $ 0.22. How does 2.75% look now? With the proper pricing method, you could be accepting those cards at under 1/2 of 1%, depending on what a provider offers you. Debit cards are always the lowest card rate out there, and the above mentioned aggregators count on that being most of what you take. Over the last few years, very few card rates have gone up on the wholesale, yet PayPal went to 2.90% during that time. I can only guess at why the increase, but I have my suspicions it was due to American Express not giving them a break on the cost, as well as all the new card fees. American Express has now come down, but PayPal hasn’t. Square is still trying to find their way through the industry, and will eventually have to raise, after they make a name for themselves. Amazon has enough diversity to absorb most of this with other sources of income, but that’s what they all use to keep their rates as low as they can. They all have a long fight ahead, to see which comes out on top. I’m guessing it won’t be any of them. OK, so how do you get away from the aggregators, and to a merchant service provider, and get a better deal? First off, there’s only one pricing method to consider. It goes by Interchange Plus, Wholesale Plus, Pass-thru, or True Pricing. I usually tell people to Google Interchange Plus, as that’s the most common name. What you’ll see when you do, is it’s a flat rate tied directly to the wholesale rate of every card. So instead of getting one flat rate to cover over 200 card rates, you get a flat rate added to each cards wholesale rate. Instead of paying a variance in markup like above with a flat rate for all, you get a flat rate for each. This can bring your debit cards down under 1/2 of 1% like I mentioned, and most of your credit rates will be around 1.80%-2.4%, depending on your business type, and the average size of your ticket. If you’re taking mostly debit cards at under 1/2 of 1%, then the over all cost to you, due to the credit cards you take, is pulled way down by the debit cards. Bringing your overall average to well under the 2.50%-2.90%. In some cases, again, depending on the size of your average ticket, to under 2% over all cost. How to compare merchant service providers statement to the cost of one of the aggregators above. There’s really only one rate you need to know when it comes to accepting credit cards, your “Effective rate”. This is the rate you actually pay, after everything’s included. Let’s use Square for an example. Last I looked it was 2.75% swiped, but 3.5% & $.15 keyed in. To find out exactly what effective rate you paid, you’d take your total cost that Square charged you any given month, and divide that by the total volume in sales you ran. This is your effective rate, your total cost for accepting cards. It works the same way with a merchant service provider’s statement. So after the long list of fees are added together, and divided by the total sales, you can be a lot lower on your effective rate with a merchant service provider, than you can with one of the aggregators above. So in short, your effective rate is really the only rate that matters, with any type of setup. The more debit cards you take, the lower your effective rate will be. So even though the flat rates sound good, simple, and less headache, they’re actually costing your business more overall. You could probably use that money elsewhere I’m guessing.